Dr. P. Roc Chen is a board-certified neurosurgeon, sub-specializing in open cerebrovascular, endovascular neurosurgery, and skull base neurosurgery, with expertise in brain aneurysms, arteriovenous malformations, carotid disease, acoustic neuroma and skull base tumors. 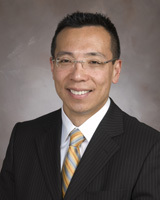 An associate professor of neurosurgery at the McGovern Medical School at UTHealth, Dr. Chen received his medical degree from Sun Yat-Sen University of Medical Sciences in Guangzhou, China, followed by residencies at Brigham and Women’s Hospital and Children’s Hospital of Harvard Medical School. He has completed fellowships in neurointerventional radiology at Brigham and Women’s Hospital of Harvard Medical School, in cerebrovascular and skull base surgery at Barrow Neurological Institute and in neuroendovascular surgery and cerebrovascular neurosurgery at Thomas Jefferson University Hospital. Dr. Chen has authored and co-authored many peer-reviewed publications in cerebrovascular disease and other subjects in neurosurgery, particularly flow shearing related brain aneurysm formation, subarachnoid hemorrhage management and surgical and endovascular techniques in treating brain aneurysms. He is currently the Principal Investigator for a multi-center randomized clinical trial in the treatment of cerebral vasospasm following subarachnoid hemorrhage, due to brain aneurysm rupture. He is involved in multiple clinical trials using the latest endovascular technology in the treatment of brain aneurysms and carotid disease, as well as brain AVMs (arteriovenous malformations). One of Dr. Chen’s specialties includes treatment of brain occlusive disease (for example moyamoya disease, which causes stroke), by performing extracranial to intracranial bypass anastomosis surgery. His expertise includes treating a large number of complex acoustic neuromas and other skull based meningiomas. Dr. Chen has co-authored studies published in Neurosurgery, Proceedings of the National Academy of Sciences, Neurosurgical Focus, Acta Neurochirurgica, the Journal of Neurosurgery: Spine, the Journal of Biological Chemistry, BNI Quarterly and the American Journal of Physiology, among others. He is the institutional co-principal investigator of multiple studies, including: "A Randomized Multicenter Clinical Trial of Unruptured Brain Arteriovenous Malformations" (ARUBA study), "Albumin in Subarachnoid Hemorrhage-induced Vasospasm Trial" (ALISAH), "Evaluation of Presidio and Cerecyte Coils in Large and Giant Aneurysms" (PAC study), "ev3 Researching AXIUM Coiling Experience and Recanalization (RACER) Study", "Cordis Enterprise Vascular Reconstruction Device and Delivery System", and the "Wingspan Intracranial Stent" study. Dr. Chen is also an acting investigator for the "Interventional Management of Stroke Trial Phase III (IMS-III)" and "MR and Recanalization of Stroke Clots Using Embolectomy (MR RESCUE)" studies. Dr. Roc Chen and the body of experts at the Memorial Hermann Mischer Neuroscience Institute save a four-year-old girl’s life with a superglue repair of an AVM in her brain.